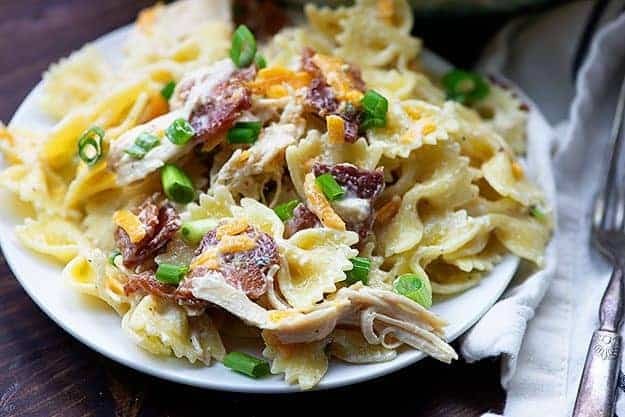 Chicken pasta salad bursting with cheddar, bacon, and ranch! This easy pasta salad is going to be the hit of your next barbecue! I think I’m going to move south. Mostly just for the cold pasta salads. But, obviously, also because of the southern accents. I want an accent. But yea. For the pasta salad. You see, up here in Illinois, it’s cold half the year. We don’t eat pasta salad in the cold. At least not often enough for my liking. So, I’m moving south so that I can make this easy pasta salad all year long. 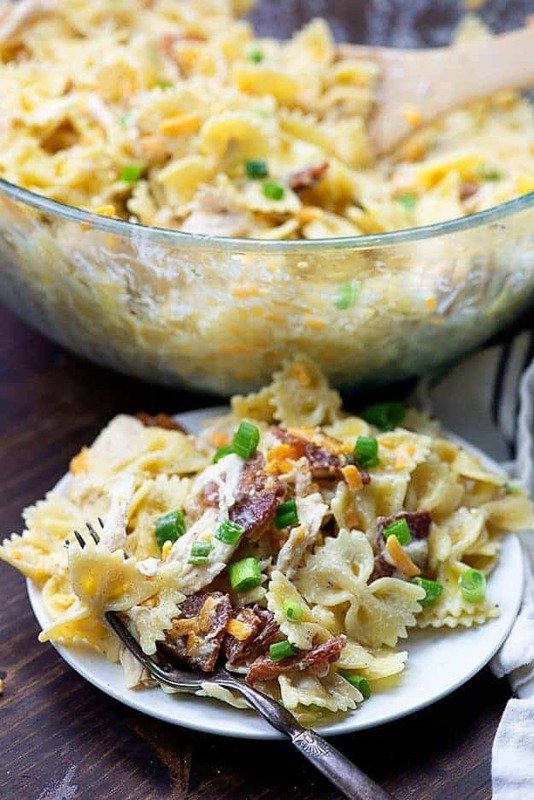 I mean, this is a bacon cheddar ranch pasta salad with bits of juicy chicken inside. Obviously, I need to be making this year round. First let’s talk about the dressing. Pasta salad is often dressed with an Italian sort of dressing – olive oil, vinegar, and some herbs. Today, we use homemade ranch. Well – homemade in the sense that it doesn’t come from a bottle, but I am totally using the little packet of seasoning, because I love it and it’s easy. I do have a homemade seasoning mix – I should probably share that recipe with you guys soon. Would you use it do you think? Anyway, this dressing is just mayonnaise, buttermilk, and ranch seasoning. Easy peasy. And, if you don’t want to buy buttermilk for this recipe, use this homemade buttermilk substitute. Start with your favorite small shape of pasta. I’m using Farfalle, or the ‘butterfly pasta’, as my youngest calls it. 😉 This pasta salad works great with macaroni, rigatoni, penne, etc. Boil your pasta until al dente. Don’t overcook it or you’ll have mushy pasta salad and nobody likes mushy pasta salad. While the pasta boils, fry up some bacon. You can do this on the stove, in the oven, or in the microwave. Whatever works for you, works for me. You’ll also want to grab some cooked, shredded chicken. I use this recipe for shredded chicken. Grate some cheddar and chop some chives. That’s it! 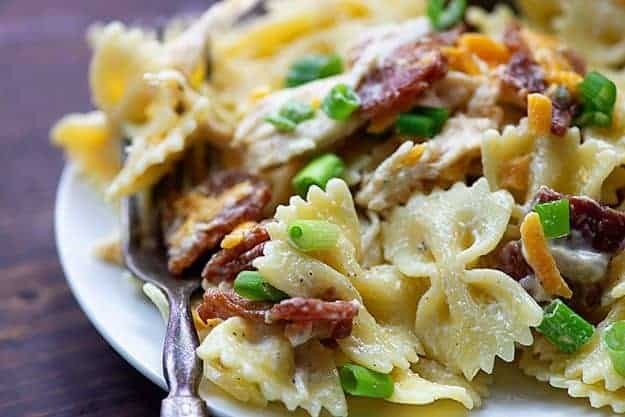 To assemble, just drain your pasta well and add crumbled bacon, chicken, and cheddar to the bowl. Top with the dressing and stir to combine. This is best if it has a couple of hours to sit for the flavors to meld. Cover tightly and pop it in the fridge. I promise it’s worth the wait! How long will ranch pasta salad keep in the fridge? This pasta salad should last in the fridge, tightly covered, for 3-5 days. 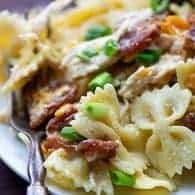 This will depend on how fresh the other ingredients are – if you’re using leftover chicken that’s already been sitting around for a few days, you’ll definitely want to consider that when deciding how long this pasta salad will keep. What to serve with this pasta salad? 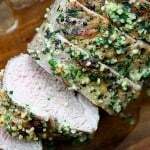 But, more specifically, this is a great side dish for my pulled pork, turkey meatloaf, crispy baked chicken drumsticks, and Italian beef. My Italian pasta salad is loaded with pepperoni, salami, and fresh mozzarella. 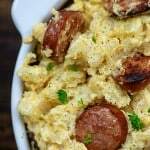 This macaroni salad is my mama’s famous recipe. And if you want something, you want this buffalo chicken pasta salad. 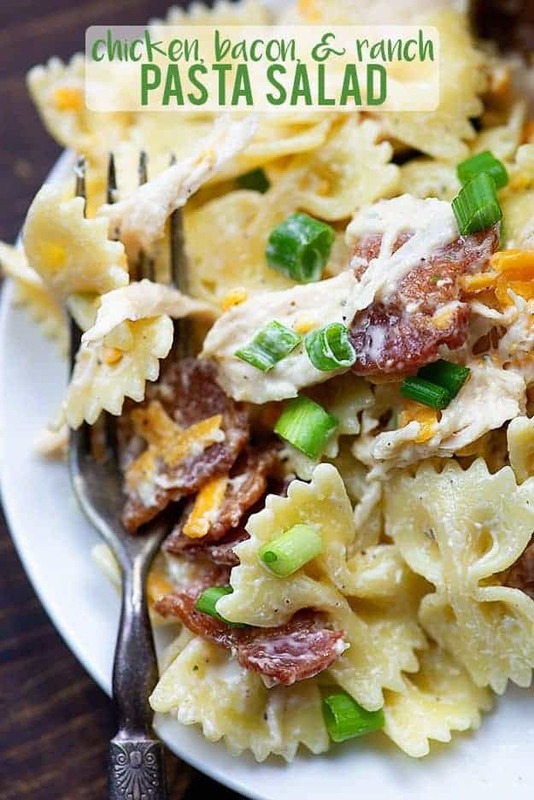 Hope you guys enjoy this bacon ranch pasta salad as much as we did! I bet it’s the star of your next barbecue! This ranch pasta salad has just a handful of ingredients but it’s packing in a lot of flavor! 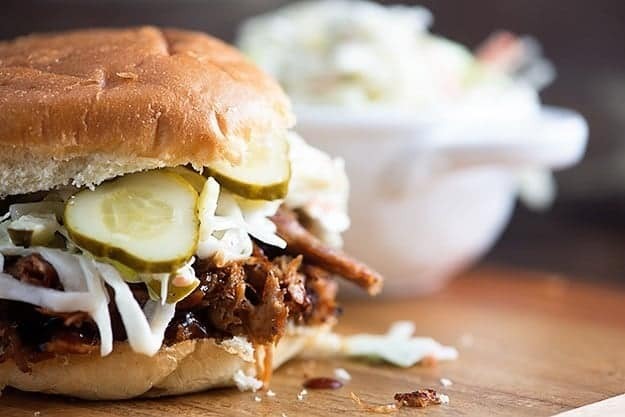 Serve at your next barbecue alongside any grilled meat. Boil the pasta according to package directions. Drain and run under cold water to cool. Add the mayonnaise, buttermilk, and ranch seasoning to a small bowl and whisk well to combine. Pour the dressing over the bowl of drained pasta. Add the chicken, cheddar, bacon, and chives to the bowl and stir to combine. Store tightly covered in the refrigerator for 3-5 days. To save a bunch of $$ make the dry ranch mix yourself. I triple it and keep it in a pint quilted Mason jar in the cabinet. Also, I buy cans of dry buttermilk powder either from the grocery store or Amazon. With the ranch dressing I mix the mayo and sour cream real well and add milk 1Tbsp. at a time til I get the right consistency. When using the powder for baking I add the correct amount of powder to dry ingredients and either milk or water with the liquids. My family will love this pasta salad! 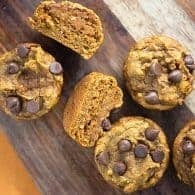 It looks easy and delicious! This is naughty! Like you said Satan! Haha but bad in the best way possible. As in I think I’d have numerous servings!! 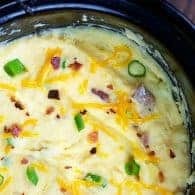 My mother in law likes bacon, so will handle her this recipe, thanks! I’m such a sucker for anything and everything ranch! Adding this to this weeks menu! Fantastic combination of ingredients. Our family thoroughly enjoyed on Mother’s Day.